Well done to Cadbury (well known UK chocolate maker) for committing to take their Dairy Milk chocolate to be Fairtrade certified from Autumn 2009. Their approach to releasing the information is also refreshing – they’re carrying out a live webcast as we speak/type at Cadbury Live. 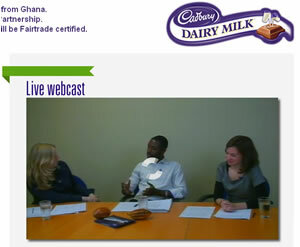 Cadbury is also opening themselves up to questions from the public, while the live webcast is going on. All good news, but quite quaint to see that incoming questions are being read from a piece of paper rather than the expected laptop screen. Thanks to for alerting us to this. You know what it’s like when you want a drink at a busy bar – it can take ages to get yourself served sometimes. Often because the bar tender doesn’t know you’re waiting. Those behind new bar, twentyfour London, claim that this is all in the past. 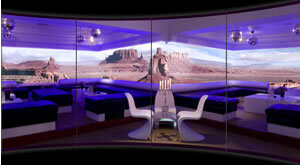 Alongside a whole host of interactive and technology whiz bangs, this bar helps you get served. 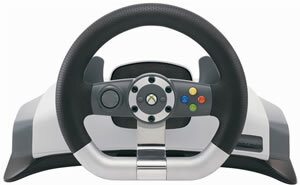 After some reports of problems with “smoking” when mains power units have been attached to Microsoft’s Xbox 360 wireless Racing Wheels, they decided to fix, or in their language “retrofit,” them. Their use of language really is spectacular, beyond “retrofit,” they also say that the “AC-DC power supply is used to energize the Wheel.” Energize! What’s this? Star Trek? Another week, another purchase of a Web-based service by a TV broadcaster. 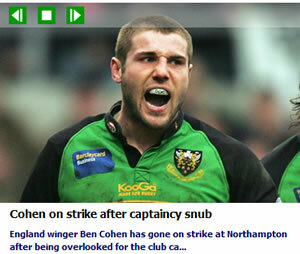 US, sports-mad ESPN have announced that they are buying UK scrum.com, a site that, not surprisingly is about rugby. There’s been a number of moves of late by broadcasters to buy Web sites that focus on, what to broadcasters, are small niches – such as Discovery buying Treehugger.com, Cricket site, Cricinfo, which was also bought by ESPN and most recently cycling.tv by JumpTV. BBC Worldwide has knocked out another content deal, this time to UK mobile company, O2. The deal, initially covering 300 individual pieces of content, includes video clips, wallpapers and ringtones from popular BBC TV programmes such as The Office, Little Britain, Doctor Who, I’m Alan Partridge, and League of Gentlemen. The various digital bits will be available, for purchase, from O2. After a pretty long period of speculation, Microsoft have confirmed that they’ll be dropping the price of the Xbox 360 in the UK and releasing the Elite version too. 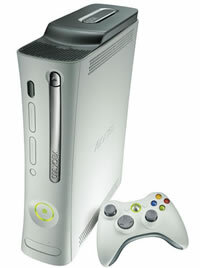 As of this coming Friday (24 August) the entry model Xbox 360 Core will have a retail price of £180 – a £20 drop and the 20GB hard drive 360 will gain a retail price of £250 – a £30 drop. Filling out the top of the line pricing will be the Xbox 360 Elite, which brings an HDMI video port, wireless controllers, a black finish and 120GB drive – all at £300. The UK Office of Fair Trading has issued an Invitation to Comment on the proposed deal of Amstrad being bought by Sky. The OFT does this when they thing that the deal needs to be looked at and is the first stage of possibly taking it further. We’re sure that this will be welcomed by the various other companies that currently provide Sky with digiboxes around the world, and potentially by other too. If you want to leave a comment, details can be found on the OFT site. Early this morning, Vodafone released news that it had decided not to exercise it’s Put option to sell its $10Bn interest in Verizon Wireless to Verizon Communications. This is the fifth and last year that they had to exercise this option after Verizon Wireless was formed in 2002 when Verizon Communications and Vodafone decided to pool their US operations. Vodafone Chief Executive, Arun Sarin, recently said that he thought the currently value of the shared they hold to be $15 billion. It’s understood that Verizon won’t be particularly happy about this, as they’re keen to get their hand on the whole venture. 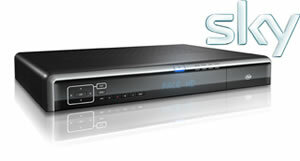 Good to hear that Pace Micro, veteran UK supplies of technology, have signed another deal to supply Sky with Set Top Boxes. Pace tell us that in their latest round of contract awards from Sky, Pace has won additional Digibox business for the 2007 financial year. If you listen to our interview with Mark Taylor, you’ll have heard a very interesting point that was raise in the OSC discussion with the BBC Trust. The BBC Trust are totally fine with BBC content going out to over the Internet _without_ content protection – ie DRM. This would be in-line with the BBC’s view of distributing their TV content over satellite in the UK, where in 2003 they made Sky beam out the BBC TV channels without encryption – much to Sky’s displeasure – saving themselves £40m – £85m in the process. This is of course still an avenue open to the BBC. We wonder how much of the License payers money would be saved on DRM if they were to take this route?